To be able to register the documents, for the first time, there are some steps that must be taken to access the application. 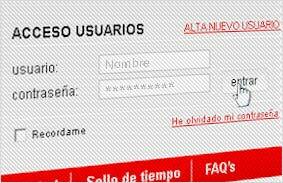 Once you have registered, you can directly access your private user account and send your documents at any time. the user can store/upload their documents en el servidor seguro de la Cámara de Comercio de Barcelona. This document can not exceed 4 MB in any format or length. Once the document has been registered on the server, to ensure maximum security, it is stored in encrypted form and generates a time stamp. The user receives a digital file in PDF format that certifies that the document has been deposited at a certain time and on a certain date on the server. This registration will be deducted directly from the balance of their pack. From their private account, the user can access documents stored on the server, modify data, or download a copy. Any change that a copy undergoes and is then sent back to the server is considered a new document that generates a new time stamp and is deducted from their pack. The maximum time documents will be saved in the depository server is five years. 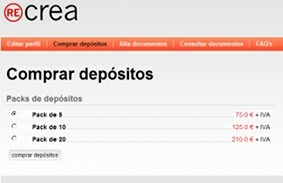 A month before the end of the period, the user is reminded of document expiration, and will have the chance to renew their registration for a further period of three years. 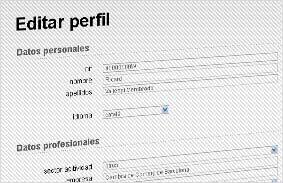 If the user has not renewed the service before the expiration date, the document will be automatically cancelled and all stored information will be lost. 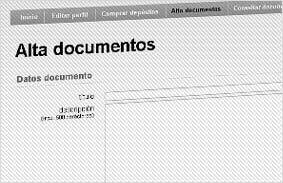 Access the application to be able to upload documents. Camerfirma express corporate server certificate. 1.- It certifies that a particular domain has been registered in the name of the organisation identified in the certificate. 2.- SSL protocol enables it to guarantee totally confidential client-server communication that cannot be intercepted or modified by third parties. This certificate guarantees the security of transactions between Re-crea users and the Barcelona Chamber of Commerce where the documents are stored. Payment gateway.Generally known as the virtual POS application (point of sale terminal): enables users to make on-line purchases using a credit card with automatic on-line validation. The advantage is that the transaction takes place directly on the bank server. Time stamp issued by the Real Observatorio de la Armada.This establishes the reference time in Spain, taken by AC Camerfirma as the time reference. 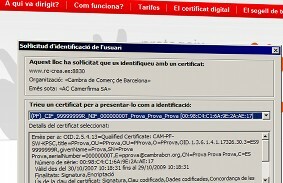 Digital certificate.Granted by certification organisation AC Camerfirma and recognised by the Spanish Digital Signature Law 59/2003.